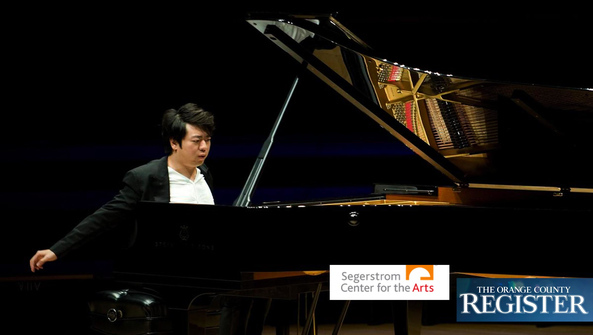 The globetrotting pianist Lang Lang gave an astonishing recital Monday night at Segerstrom Concert Hall. The performance inaugurated the 62nd season of the Philharmonic Society of Orange County as well as a new series: the Henry T. Segerstrom Legacy Series. The program, consisting of Tchaikovsky's neglected "The Seasons," Bach's "Italian Concerto" and Chopin's four scherzos, felt fresh enough. Lang Lang has been touring with it recently; the Tchaikovsky and Chopin are featured on his latest Sony recording. He performs the same program Friday at Carnegie Hall. At encore time, he told us that he was in Cuba "two days ago" – he was in Germany on Sunday accepting more awards – and then played us a rambunctious Cuban dance. The second encore was Mozart's "Rondo all Turca," which was given the whiz-bang treatment and to which the audience actually clapped along.